Imagine yourself settled into a theater seat, popcorn at the ready in one hand, drink in the other. The lights go down and the screen charges to life with the epic you came to see. After production and title cards fade in and out, you cram popcorn kernels into your mouth, mesmerized by the film and barely conscious of what else is happening around you. Then, some minutes into the film and after the inciting incident, you witness the camera panning from the weary but determined faces of the heroes to an aerial shot of the same characters on their quest, amid awe-inspiring scenery (these days, from New Zealand or Iceland). The scene signals the beginning of what will be the climactic journey. I eagerly anticipate this moment in movies I enjoy over and over again, and I am excited when such a scene is included in movies that are new to me. It is the epic story starter; it alone holds infinite inspiration for stories. 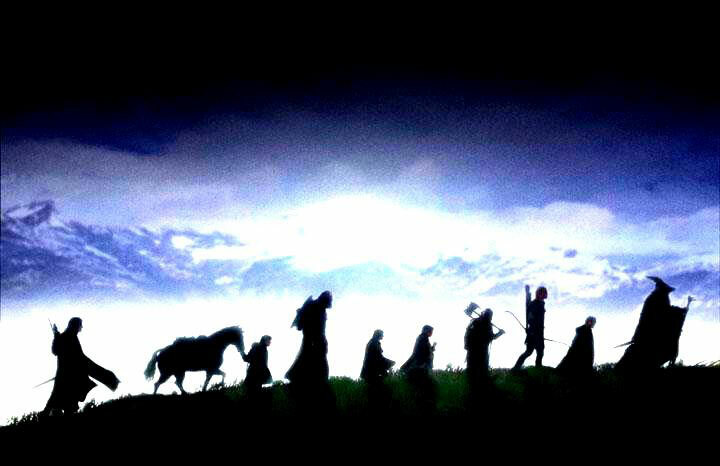 The first example that comes to my mind is from The Lord of the Rings: The Fellowship of the Ring, as our band of heroes (the fellowship) trudges up toward the mountain pass of Caradhras. They file past the camera, one-by-one. The characters trek along at a driven pace. In their eyes burns the determination to fulfill their quest. The aerial shot imparts the vastness of the mission before them, aided by the swelling music. If you came across such a scene, absent the backstory, you still have two story plot points immediately at hand: where are they from and where are they going? Next, what are the individual stories to tell, in addition to that of the journey? A writer could hardly help but apply a story to the “journey” scene. What are some of your favorite examples? Image courtesy of The Lord of the Rings Trilogy Facebook. This entry was tagged character, climax, hero’s journey, inciting incident, inspiration, journey scene, plot points, scene, story starter, writing. Bookmark the permalink.